Accenture's survey includes insights from nearly 1,000 CMOs and more than 500 CEOs. Only 17 percent of marketing leaders are pushing for transformational change at high levels within their companies, according to new research from Accenture. 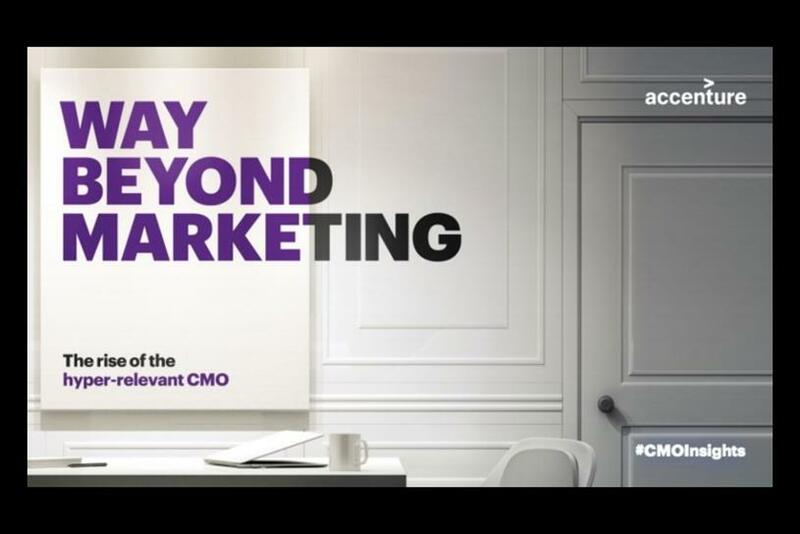 The report, "Way Beyond Marketing – The Rise of The Hyper-Relevant CMO," includes insights from nearly 1,000 CMOs and more than 500 CEOS. One key takeaway from the survey is that customer experience is critical for brands. The 17 percent of marketing leaders driving change are helping to generate 11 percent higher shareholder returns than their competitors by focusing on relevant customer experiences. Accenture surveyed 17 industry groups in 12 countries for the report, including Australia, Brazil, Canada, China, France, Germany, Italy, Japan, Singapore, Spain, the U.K. and the U.S.
Another key insight from the research revealed that more than three out of four (76 percent) of CMOs believe that consumers have higher expectations today of a brand’s purpose. Additionally, 70 percent of CEOs say that companies that take a stand for a bigger purpose achieve greater commercial success. Nearly one-third (31 percent) of CEOs also said they expect CMOs to drive growth by creating new products, services and experiences based on customer data and insights. More than 75 percent of CMOs in the study said that past formulas are no competition for the new disruptors in the market that deliver relevant customer experiences. Accenture believes that brands can combat this by creating "Living Businesses," which continuouously adpat at the necessary speed and scale to achieve customer relevance and sustainted growth. "While the digital revolution has more than delivered in bringing companies closer to their customers, many large incumbents have struggled to capitalize on the growth opportunity. To truly become a ‘living business’ where companies are able to anticipate and respond to fast-changing consumer needs, they need to design experiences steeped with empathy for customers and enable cross-functional agility with a focus on helping customers achieve their goals," said Glen Hartman, head of Accenture Interactive, North America, in a statement.